A newly minted yeast showed up on my grocer’s shelves last week. 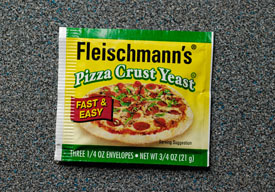 Made specifically for pizza crust by Fleischmann’s, a venerable yeast company now owned by Associated British Foods, Pizza Crust Yeast promises a fully risen crust in just 30 minutes. Turbo-charged in other words. I just had to give it a spin. Before I get too specific, let me tell you this: the yeast performed admirably. We made test runs with two different doughs using the specialized yeast, both in the conventional oven and in the woodfired oven, and every pizza came out beautifully. The crusts were puffy and mature despite the brief rise. My favorite was made with half caputo flour and had a longer rise time than the promised 30 minutes, while the meat-lovers in my family gave two thumbs up to the fast rising pepperoni pizza made with a crust recipe very similar to the one on the package (see Great Pepperoni Pizza in 40 Minutes for recipe). What’s different about this yeast? Besides dry yeast granules, the package contains a cocktail of emulsifiers, antioxidants and enzymes that speed the growth of the yeast. You also add water that is 10 or 20 degrees warmer than normal – in the 125º range – that gets the process off to a very fast start. Turbo charged, indeed! If you’re familiar with yeast doughs, you will notice a difference as soon as the hot water is mixed with the dry ingredients. 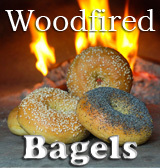 Because of the boosted heat and the emulsifiers involved, the gluten in the dough forms quickly, adding a spring to the dough that you wouldn’t feel for 20 minutes or more if using conventional yeast. With the pizza crust yeast, the dough after a few minutes puts out an earthy smell, almost as if it is cooking. This smell alarmed me a little at first, but did not linger throughout the forming and baking processes, and was not apparent at all in the finished pizzas. If you want the fastest yeast crust pizza available, use the dough recipe in my 40 Minute Pepperoni Pizza. The 30-minute dough (plus about 10 minutes of baking) held together better than any quick dough I’ve ever made. For best results, bake the pizza directly on a pizza stone or quarry tiles on the center rack of your preheated oven. If you want a more mature crust that tastes like a high-quality pizzeria pizza, in the same recipe use caputo flour for half the flour and cut the amount of yeast in half. Knead well and let dough sit for an hour before forming your pizza. This 90-minute dough will rival an artisan crust, although it will lack the nutty flavor that comes with an overnight rise. Meanwhile, before you rush to the store to get some of this whiz bang pizza crust yeast, you might want to know what the added ingredients are and what they do. As far as I can tell, these are well-accepted additives in the food world; you can google any one of them for more info. Sorbitan Monostearate – a waxy derivative of sorbitol that aids yeast cells in their ability to absorb water. This one is found in active dry yeast as well. Ascorbic acid – an antioxidant food additive group that contains as one of its members vitamin C. This is an accepted dough enhancer which I have used in small quantities to nourish and freshen the flavor of breads. Fruit Fresh is one brand, available as an additive to preserve color in canned fruits and vegetables. L-cysteine – a nonessential amino acid that has antioxidant properties. Enzymes – proteins that speed the rate of chemical reactions. Conclusion: If you’re in a hurry for a good homemade crust, this yeast will do the job of speeding things up. And since it does that in about the time it would take to bake a frozen pizza, I say the decision is a no-brainer. After all, the best pizza is the one you make yourself! So go on. Give it your own test drive. I think you’ll agree at the finish line that pizza crust yeast is a real winner! 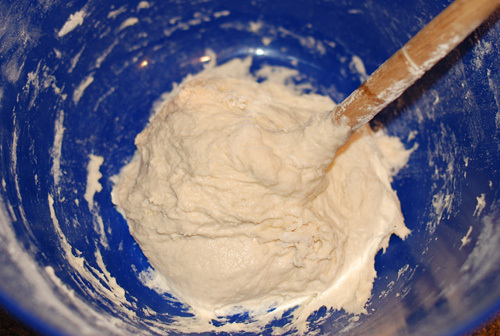 Dough after 2 minutes: you can already tell that this yeast is different! WOW! 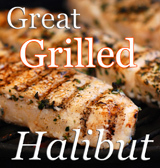 What a great review. I am totally going to try out this yeast. Thanks for sharing and explaining so well! A wonderful write up about the pizza crust yeast. I haven’t seen it at the stores, but I also haven’t looked for it. Will keep an eye out the next time I walk down the baking aisle. Good review – I shall keep my eyes peeled.